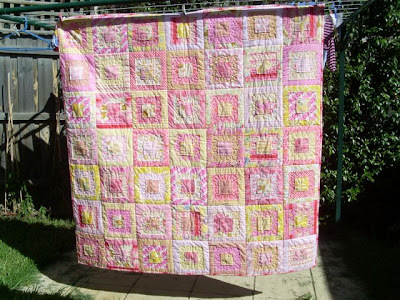 .... but I have finished another quilt for Ella. I used Amandajean's tutorial for her ragged squares quilt. But I quilted it differently. Ella loves it. Pink and yellow are her colours du jour. Oh, wow, that is gorgeous! 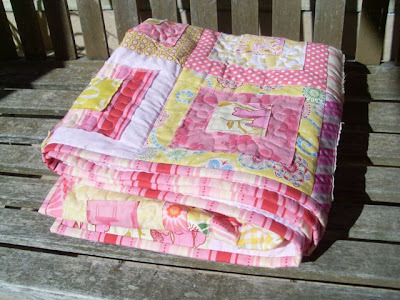 You have an amazing eye for colour, and amazing quilting. I already have to unpick some of my new one, and my unpicker is broken (which is why you shouldn't use them as a screwdriver! )- I feel like such an amateur! If I rub you the next time I see you, you know why haha. I love it ! love the colours, love the fabric, love the pattern. It is lovely! Wonderful colors and quilting. And I always love a striped binding. you make really nice things andi! Very pretty!You know I'm a sucker for pink! GORGEOUS!!! 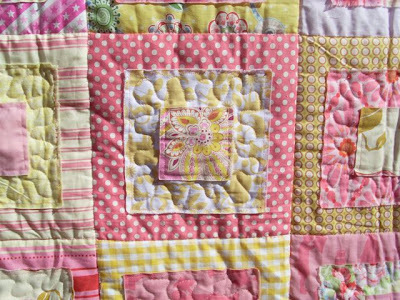 i love the way that you quilted it, too. the colors are beautiful!!! Thank you for your letter. The postman delivered it to us today. I have had so much fun with the great stickers. I really like stickers. That is positively, absolutely - divine! Clever you. One job down. Many more to go! Let's talk about PINK, baby! !